Game of Thrones may be off air at the moment, but the merchandise continues thick and fast. Here we have a couple of officially licenced pint glasses. The glasses weigh in at a hefty 912 grams, with thick, substantial glass with an overall size of 15 x 8.6 x 8.6 cm. Oddly enough they both hold a pint, and believe me I tried several times [Should you be reviewing while intoxicated? - Ed]. 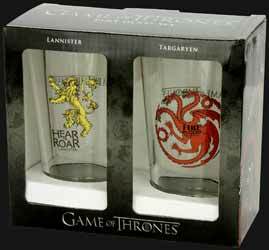 The glasses come in two glass sets and we are looking at the Lannister and Targaryen set. Each glass has three transfers. The bottom has the HBO trademark, the back of each glass reads "Game of Thrones" and the Sigil and house saying is on the front. There are times when a product should go with what most of the audience knows rather than canon. In the case of House Lannister, beneath the lion is written ‘Hear me Roar’. Now I know that this is right, even though it is rarely used, rather than the more common "A Lannister Always Pays His Debts", but the former does sound more like Katy Perry, than Tywin. The second glass has a transfer of house Targaryen, the three headed dragon which foreshadows Deny's three dragons, with the house saying, "Fire and Blood". Overall they are nice pieces, but I would worry how hardy the transfers are, if the glasses are used regularly, as they cannot be placed in a dishwasher.